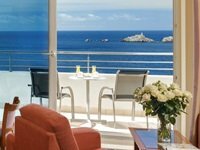 Hotel Neptun is a part of the Importanne Resort in Dubrovnik. This 4-star hotel has the highest hotel building in Dubrovnik and offers amazing views of the sea and the Elaphite islands. Beautiful beach area, crystal clear sea and unspoilt nature are just a few of the advantages for guests staying at this hotel. Hotel Neptun offers 79 rooms and 12 family suites. All rooms are air-conditioned and feature a flat-screen TV with satellite channels, a mini bar, a safe, a hair dryer, a direct dial phone and other necessary amenities. The modern, private bathrooms are all equipped with bathrobes, slippers and toiletries. Guests can choose from standard rooms (garden view), panoramic rooms (sea view) and family suites with or without the balcony. Hotel's guests can choose from three restaurants and a beach bar & lounge. The Zoe Restaurant is a la carte restaurant offering a great selection of Mediterranean and continental dishes. The staff of the resturant will be pleased to recommend a wine to accompany delicious meals. This restaurant has great location overlooking the sea. The Mediterraneo Restaurant is a buffet restaurant which provides good selection for breakfast and three choices of menus for lunch and dinner including vegetarian cuisine. La Castile Restaurant is a place you should visit if you seek for tasty food, excellent service and a great atmosphere. 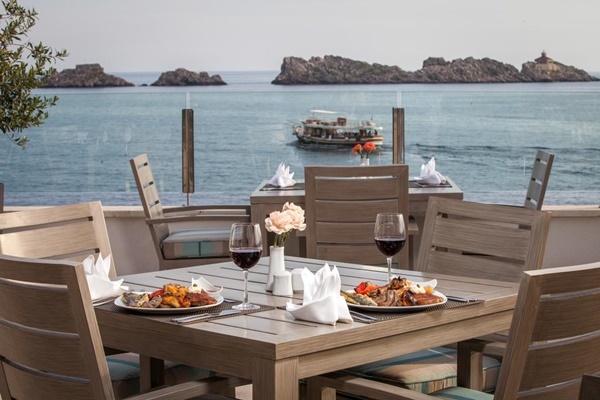 This newly opened restaurant is located on an outdoor terrace with amazing sea views. The restaurant serves Mediterranean and fusion cuisine. On the Rocks Cocktail Bar & Lounge is located in beach area. It boasts a spacious terrace where you can enjoy throughout the day. This bar serves all kinds of hot and cold beverages, coctails and light meals. 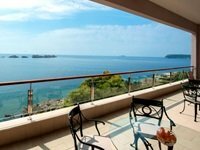 Guests booking a vacation at Hotel Neptun Dubrovnik may use the beach within the hotel complex. The beach consists of rocky and concrete area with several ladder points to climb into the sea. For the use of guests, there are also two outdoor pools for adults and children's pool. Beach umbrellas are available on the beach, together with deck chairs and towels. Importanne Resort offers its guests use of wellness and spa centre. They can choose from a wide range of massages or enjoy a Finnish sauna, steam bath or indoor pool. Hotel's fitness studio is equipped with the latest exercise equipment. Use of the fitness room, saunas and indoor pool are free to all of hotel guests. At the Information desk guests can book a range of sightseeing tours and excursions (Dubrovnik's Old Town, the Elaphite islands, Peljesac, Montenegro, Bosnia & Herzegovina). You could also rent a bicycle to explore Dubrovnik on your own. For the children the hotel offers baby care and a playground. Snorkelling masks can be hired from the hotel. Free Wi-Fi Internet access is available in all public areas and guestrooms. if arriving by car, Hotel Neptun Dubrovnik has a private parking area (complimentary). Importanne Resort offers spaces that are ideal for guests to cater various business meetings, seminars, conventions and many other events. There are a choice of 12 multifunctional conference rooms, with capacities ranging from 15 to 500 people. All rooms are equipped with the latest audio-visual and technical equipment. From the hotel you can easily reach any other area of Dubrovnik. Only few steps from the hotel there is a bus stop from where you can take bus no. 6 to the Old Town. Bus ﻿no. 7﻿ will take you to the ferry port from where you can catch all ferries departing from Dubrovnik as well as organized boat tours. To reach Hotel Neptun from the airport you can prebook your private car transfer or take the airport shuttle bus to Pile gate and change there for city bus no. 5 or bus no. 6.